It is still common for market commentators to denigrate gold as a relic of little value. They claim that since it offers no dividend its only appropriate use is for jewelry--never calling to mind the hubris it takes to ignore 5,000 years of civilization that viewed gold as money. Most market strategists still don't realize that gold is money and its value is as a store of wealth and it holds its value against fiat currencies better than any Treasury asset, including TIPS. So, I thought it may be enlightening to compare the returns of gold versus Treasury Inflation Protected Securities and determine which offers a better hedge against inflation. The focus on gold and the USDollar alone lacks a crucial factor in maintaining the world currency reserve on its fragile pedestal. The PetroDollar is a term used to describe the close relationship between the USDollar and the crude oil export business dominated by Saudi Arabia , manifested in the superstructure of the global banking system. So one could say the oil world provides the pool from which the US $ exchange rate valuation is applied and enforced. The gold community pays far too little attention to crude oil factors in my opinion, but Adam Hamilton does indeed. Gold investors love to point to Iran war tensions as a factor to lift the gold price, but they might overlook how the associated earthquakes in banking shift the very ground under the world currency reserve. The silver chart looks considerably less inspiring than the gold chart at this juncture, which is perhaps not so surprising as after outperforming gold last year, it has been under performing it so far this year. On the 10-year chart the trading range that has followed the ramp from September 2005 through April last year does not look to be of sufficient duration to support another strong advance, and the uptrend channel drawn on this chart looks unsustainably steep and for these reasons the chances of a breakdown are considered to be quite high. 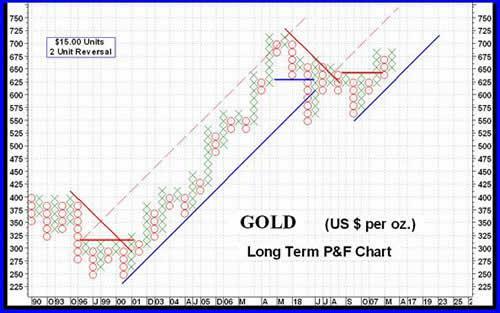 The gradual uptrend of the past 6 weeks has brought gold once again to a critical juncture. This rise has brought it up to the late February high and within $40 of last year's highs at about $730, raising hopes that it may soon break out to a new high. The recent upward move in the energy indexes signals higher prices can be expected in 2007 and oil will remain firm at current levels. It also shows inflation is still growing and global economies are continuing to expand. After 10 months of consolidation below the key 1235 resistance level, the Amex Oil Index (Chart 1) has broken out above this important price ceiling. This indicates the main upward trend in the oil sector is now continuing. And as the Amex Oil Index often leads the commodity, it also implies oil prices will remain firm at current levels as the summer driving season draws near. Technical evidence shows growing upward pressure should continue until the first half of June. There's a feeding frenzy going on in Australian uranium stocks right now. For example, two of the best uranium companies in the world, Areva and Paladin Resources, fiercely bid against each other for another company (and its resources). Larger miners are generally very conservative. So the fact that these two companies are throwing so much money around, tells me that uranium — which recently hit $113 per pound — has a long, LO-O-O-NG way to go. Much talk about this index or that index making a new high, or near a new high. The level for an index is interesting, but the return being earned is more important. A stock market index could conceivably make a new high each and every day without providing a desirable return. Today's graph compares the return over the past five years of an investment in $Gold and U.S. stocks, as measured by the total return on the S&P 500. As is readily apparent from that graph, $Gold has substantially outperformed an investment in U.S. equities. Why these results? Gold's price is a mirror reflection of the global purchasing power of the U.S. dollar. As the Federal Reserve has grossly mismanaged U.S. monetary policy over the years, the global forex market has pushed down the value of the dollar. That depreciation of the dollar's value is not reflected in the equity market. Gold is on the rise. Investors are excited, especially after last month's volatility, which proved to be nerve wracking for many gold investors. This alone reinforces why it's important to focus on the major trend. Chart 1 shows gold's mega uptrend and as you can see, the volatility over the past year doesn't look like much. On the contrary, this chart illustrates gold's strength as it sits near the high side of the rise that started in 2001. This is the most important picture to keep in mind when investing in gold. The bull market since 2001 is clearly underway. Last weekend we noted that the U.S. dollar had closed out that previous week at a new low, based on the Median U.S. Dollar Index. That weakness suggested that more weakness for the dollar would develop. Such was what happened this week as the dollar was sold against almost all other national monies. The latest valuations have the U.S. dollar closing at another new low on Friday. That condition makes the U.S. dollar over sold in the short-term, but continuing in a major bear market. The strategic view that precious metals will do well is being confirmed. A couple of ups and downs during the week but mostly ups. Are we heading for new highs ahead? The last few updates essentially took the position that the short term fundamental outlook was muddled, but that, nonetheless, precious metals stood to benefit in any likely event. Despite the ebb and flow of rate cute expectations, gold and silver (and platinum, too!) indeed extended their rallies over the past two weeks on steady declines in the dollar and persistent inflation data. An 11.9% increase in M2 over the last six weeks probably hasn't hurt either. According to Friday's Nuclear Market Review (NMR), many market participants were left stunned by the recent record jump in the weekly spot uranium price. The market has increasingly diverged between those who have U3O8 and those without. Utilities with existing supply contracts “are heaving a sigh of relief,” NMR editor Treva Klingbiel wrote. And those trying to find uranium in today's climate “are forced to face the reality of a seller's market,” she said. Is there pity for one market participant, who is now scrambling for ‘very near term delivery' of nearly 500 thousand pounds U3O8? Probably not. This buyer must compete with 7 others hoping to secure about 3.2 million pounds of U3O8 equivalent. This piece is written on the base provided by GFMS, as always, a most competent gold survey of what happened in the gold market last year . Their conclusions highlight the evolution of the gold market over the last 7 years, since the Washington Agreement was signed in 1999. At that time in an environment of a gold market clouded by the constant threat of Central Bank sales, the treatment of the metal as a commodity and the accelerated gold production fuelled by the hedging of future production at prices persistently higher than those achieved when a new mine came into production. "Shares climbed 110% yesterday and 14% today. Watch for more news tomorrow and get ahead of this new campaign..."
Or rather, that's what the latest batch of junk-and-pump emails to hit our servers here at BullionVault would have you believe. Ramping stocks is illegal, of course. Buying into the hype is stupid. Getting one of the world's major news organizations to do both for you at once...well, perhaps that's genius. In yesterday's conversation with Dr. Robert Rich, we determined he had the credentials and industry knowledge to provide Yellowcake Mining (YCKM) with credibility in the uranium space. But, what about the geology? Many juniors have skated onto the radar by using a ‘big name' to attract investors. Too often, the property's geology is lacking the factors which would lead to actual uranium mining. Often, the industry-celebrity name is barely familiar with the company's property. Soaring yellowcake prices have accelerated a greater number of uranium juniors rolling off the assembly line. As fast as stock promoters can revive old shells, joint venture a more serious uranium company's castaway property into the re-named shell, and then wheel a former ‘big name' out of retirement (or a nursing home), the company will announce they are in the ‘hunt' for uranium. Nearly all are mining the stock market – that means you, specifically the investor. Very few, probably less than 10 percent, have any realistic chance of ever putting a shovel to the ground and coming up with uranium ore. Fewer still are likely to intersect sufficiently economic delineation holes which might someday become a uranium mine.